Then We Came to the End: A Novel -- 10th Anniversary Edition (Paperback) | novel. A special Tenth Anniversary Edition of the dazzling National Book Award finalist. 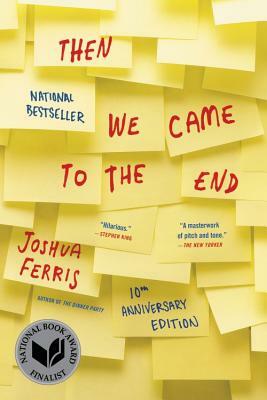 Ten years ago, Joshua Ferris burst onto the scene with Then We Came to the End, a hilarious, urgent novel about where most of us spend the majority of our time-the office. Ferris's debut was nominated for a National Book Award and was selected as one of the top ten best books of 2007 by The New York Times, Time Magazine and Entertainment Weekly. Every office is a family of sorts, and the Chicago ad agency Ferris depicts is family at its best and worst, coping with a business downturn in the time-honored way: through gossip, elaborate pranks, and increasingly frequent coffee breaks. As they attempt to stave off the inevitable, the cast of this expansive epic contend not just with job loss, but with breakdowns, break-ups, and rounds of Celebrity Death Match that force them to confront their own mortality. With an unerring eye for the details that make life worth noticing, Joshua Ferris tells a true and funny story about survival in life's strangest environment-the one we pretend is normal five days a week. Hailed by the New York Times as "expansive, great-hearted, and acidly funny," Then We Came to the End proves to be every bit as relevant and relatable as it was when it first appeared. Joshua Ferris is the bestselling author of three novels, Then We Came to the End, The Unnamed and To Rise Again at a Decent Hour and a story collection, The Dinner Party. He has been a finalist for the National Book Award, winner of the Barnes and Noble Discover Award and the PEN/Hemingway Award, short-listed for the Man Booker Prize, winner of the International Dylan Thomas Prize, and was named one of The New Yorker's "20 Under 40" writers in 2010. He lives in New York.